Kingsbarns Distillery is hoping to make its first matured and bottled whisky available as soon as 2018, but it will only be available to Founders’ Club members. Founders' Club members will receive a welcome pack upon joining. The Lowlands distillery has produced just 3,000 membership packages to mark the first anniversary of its opening on St. Andrew’s Day 2014 (30 November). Costing £500 each, the Founders’ Club membership grants buyers the opportunity to be among the first people in the world to sample the distillery’s whisky when it matures. Members will then receive a special Founders’ Club bottle every year for a further four years. 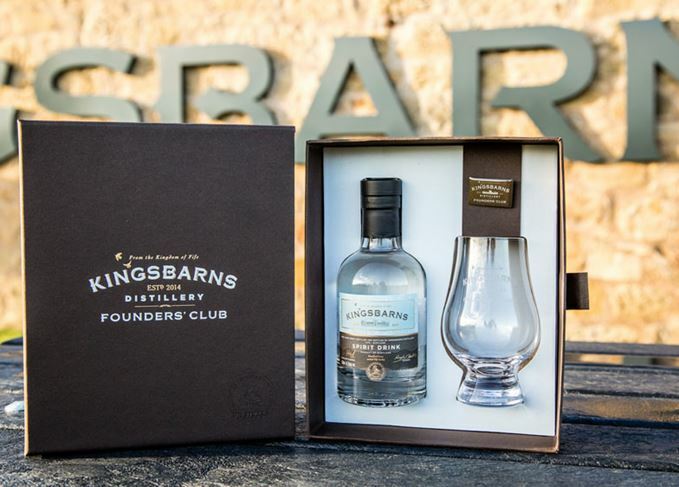 The pack also includes a 200ml bottle of Kingsbarns’ new make spirit, a Founders’ Club Glencairn glass, a membership badge and a welcome letter. Many start-up distilleries sell casks of new make spirit to start earning income, an idea started by Isle of Arran Distillers in the 1990s. Other recently founded Scottish distilleries to adopt the practice include the Glasgow Distillery Company, which released a small number of casks as part of its 1770 Club membership, while casks of new make from the Ardnamurchan Distillery range from £1,950 to £5,650. Douglas Clement, a golf caddie and Kingsbarns founder, had wanted to start distilling on the site close to the golf course of the same name, but struggled to secure its financial future until selling the company to the Wemyss family for £3m in 2013. Kingsbarns’ new make spirit is also available to buy from the distillery’s website for £14.95 for a 200ml bottle. The £12m distillery will produce both peated and unpeated Lowland malt whisky. The Lowland distillery has released its first widely-available whisky since opening in 2014.